As much as I love going to the salon to get my nails done, what I love even more is the convenience of giving myself a top notch long-lasting manicure using amazing products. I used to struggle with getting my nail colour to last where I would find it chipping only a day or so after I painted my nails! I realised that I wasn't actually doing anything to ensure my manicure was long lasting - all I was doing was slapping the colour on. I have since realised the importance of a good base coat and top coat to go with your colour of choice and will be talking you through my 3-step manicure process today. It's simple but seriously effective - I can have these manicures last nearly 2 weeks! This pearly white formulation is the perfect base coat for any nail colour to go over the top. It creates a smooth and even surface for the colour to glide evenly over. It also has a tacky finish which assists with the nail colour adhering to the nail. It is a fast dry formulation so you can almost immediately add your colour over the top once you have applied it. Now it's time to take your nail colour! For the purpose of using all Maybelline products I decided to use a shade from the Color Show range. This is a seriously affordable collection with a whole lot of colour options in the range. I have been loving this milky pink/purple hue because it is the perfect in between of a serious purple and a playful pink. This is my absolute favourite part of the manicure because it gives you a gorgeous salon finish! This top coat has a 'gel effect' which means that it leaves a thick and shiny finish on the nail. 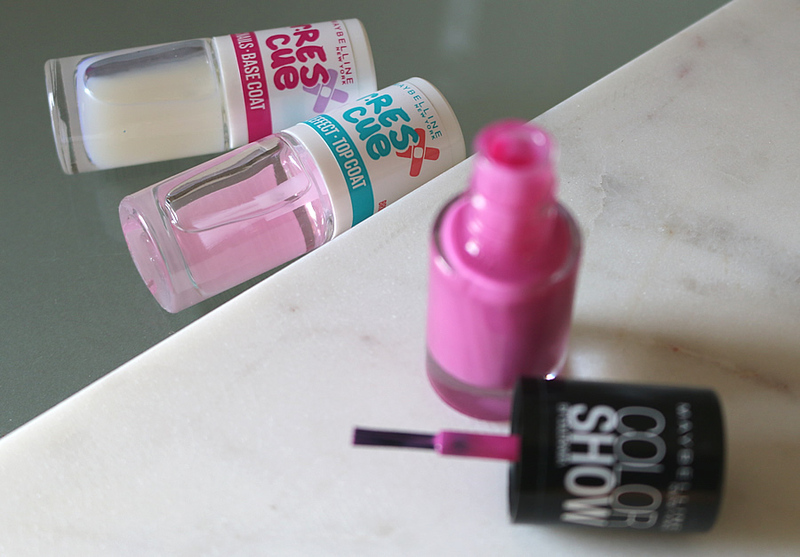 Despite the gel finish it is still quick drying and seamlessly locks your nail colour in place. I have tried many top coats- affordable and high end - but I think this one is my favourite thus far. So that is a recap on my 3-step manicure and a look into what is on my nails. 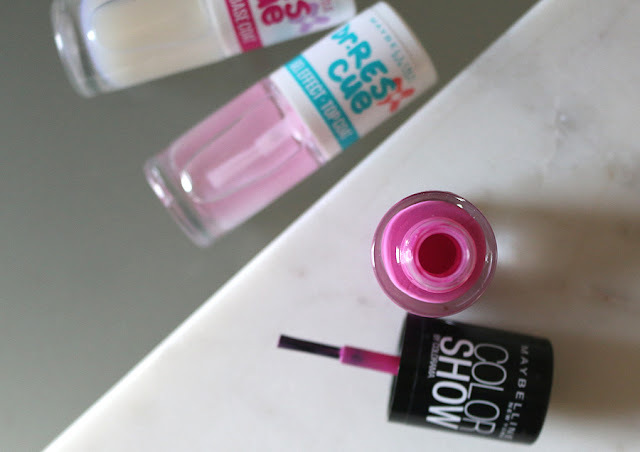 My favourite part about this manicure is how affordable each of these products are! 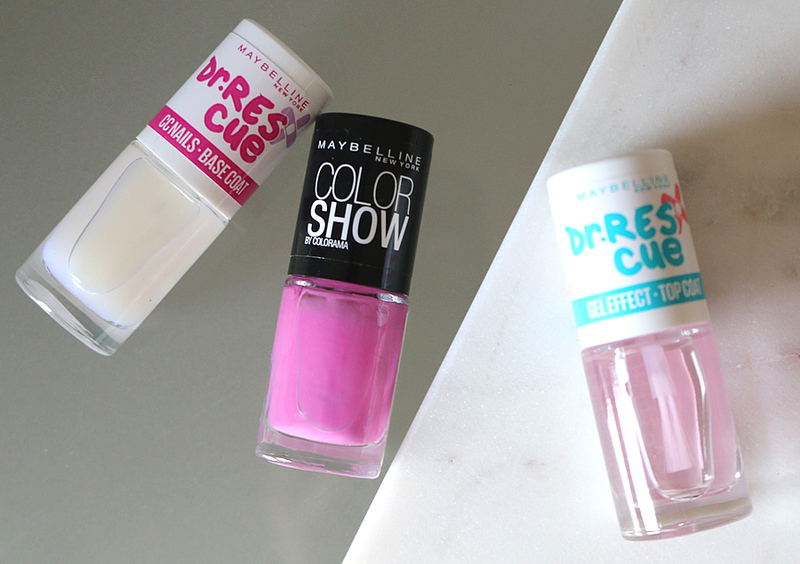 With Maybelline Color Show nail polishes retailing for just $5.95 full price and you can often catch them on sale. It's a salon finish at a bargain price.